Summer's time for baking in the sun (oh boy, it really is hot this summer! ), swimming, playing, and having fun. Do you remember in the Good Ol' Days when it also meant summer was the time for the Circus to come to town, and towns to host carnivals? 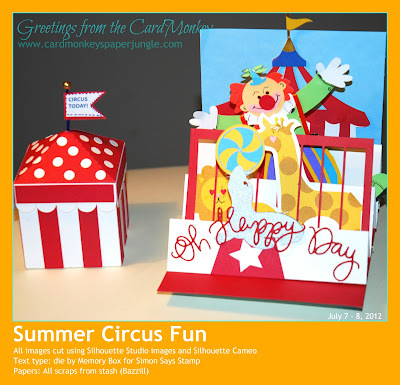 Well, I based my Summer Fun Blog Hop project around the summer Circus, and made these projects in the sweltering heat of my upstairs Paper Jungle. This is a two-day hop sponsored by Lissa Marie of So Many Crafts. We're to have two projects, one each on Saturday and Sunday. Today, let me give you a bit more info on how I made the card, "Oh Happy Day." I started off with the notion of using a step fold on a 5.5" square format. All of the cuts were pieced from those files purchased on Silhouette America's online shop, and cut with my Cameo. It's easy-peasy to use these files, and fun to find those that coordinate. I separated all of the files and laid them out digitally on my screen so that I could cut the individual colors together, and at once. In other words, on my mat, I laid out all of the colors of paper I used so it looked like a patchwork quilt on the mat. I used only Bazzill scraps of the following colors: red, pink, lavendar, bright green, bright blue, dark blue, gold, mustard, orange, grey and white. Then, on my screen, I laid out and grouped all of the digital pieces that needed to be cut of each particular color. This way (and yes, it does take time in advance to to this technique, to prepare your layout and papers), I only had to load my Silhouette once, cut once and then piece and glue working directly on my mat, layering one color atop another. Once the gluing was done, I embellished the pieces as I chose. For instance, the lion and giraffe have a twine tail and hair, respectively. The clown has ribbon for suspenders, and hand-highlighted shoes. Each of the pieces has hand-drawn mouths and eyes; I used a thin-line Copic marker, in black. I mounted the clown on his step with an Action Wobble. Be sure to stop back tomorrow when I'll describe how I made the cute Carnival cupcake box! Now what's a blog hop without a bit of blog candy?! For this Summer Fun Blog Hop, we have two very special sponsors: the Scrapbook Stamp Society and "Anita and Bugs". Please be sure to check out the entry requirements at our Hostess's stop (the beginning), by clicking HERE. This Blog Hop has been brought to you by the Krazy Crafting Crew, which brings you monthly inspiration, all year long! Love it Ellen! Cant wait to see tomorrows post! You are one talented lady. 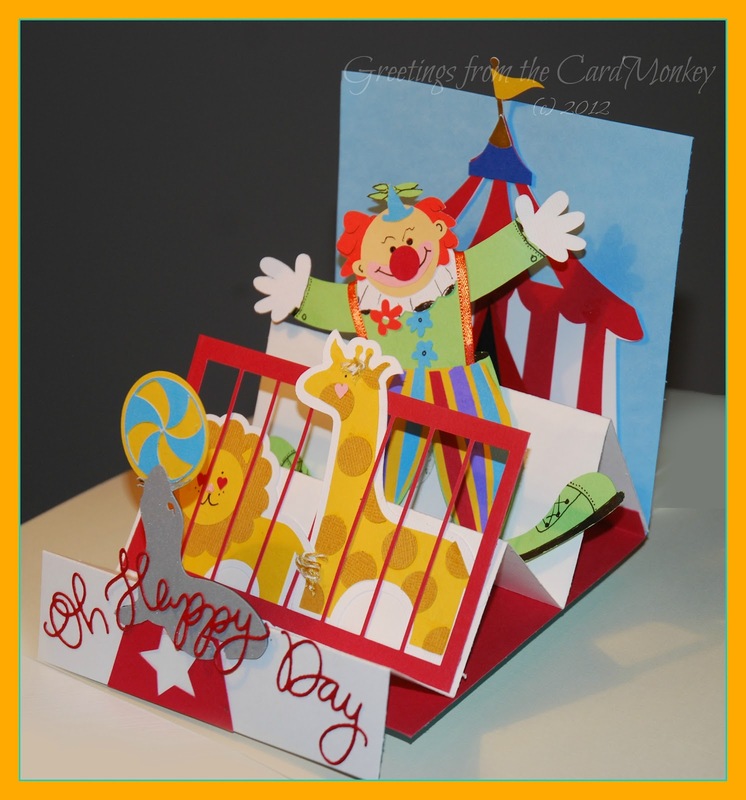 I love the card and cupcake holder and so could have used those 3 years ago for my youngest son's circus themed birthday party. They are so cheeful and bright. Oh, wow! Super cute card! It's so much fun. I look forward to tomorrow and seeing how you made the circus tent. You are fantastic!!!! !--You put a lot of work in this and it really paid off. Holy bananas that circus card is fantastic, you put soo much detail into it and the colors are so bright and cheery! Amazing! I love it. I can't wait to see tomorrow's post on the cupcake box. So cute. Super cute card and I can't wait to see how you did the cupcake box. Your card is so much fun!!!! Holy Cow!!! That is A LOT of detail!!!!! Your card is gorgeous! Sigh, she outdoes herself again! I love step cards & this one is adorable! Great job! Uggggg.... could you be any more talented??? I mean seriously..... LOL this is so fun and WOW so time consuming you did great, you must have ate a lot of bananas in order to sit still that long to make this fabulous card. I would have gone Bananas if it would have been me. You have out done yourself my friend, way to go. way to go. Love your circus theme! beautiful work! Awesome Ellen!! I just love being able to cut out all at once, I just wish I could get the hang of doing it correctly!! Yours look GREAT! I LOVE cards that have added interest. Super design.